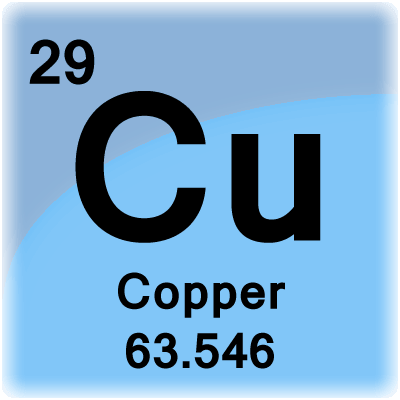 Copper is atomic number 29 with element symbol Cu. 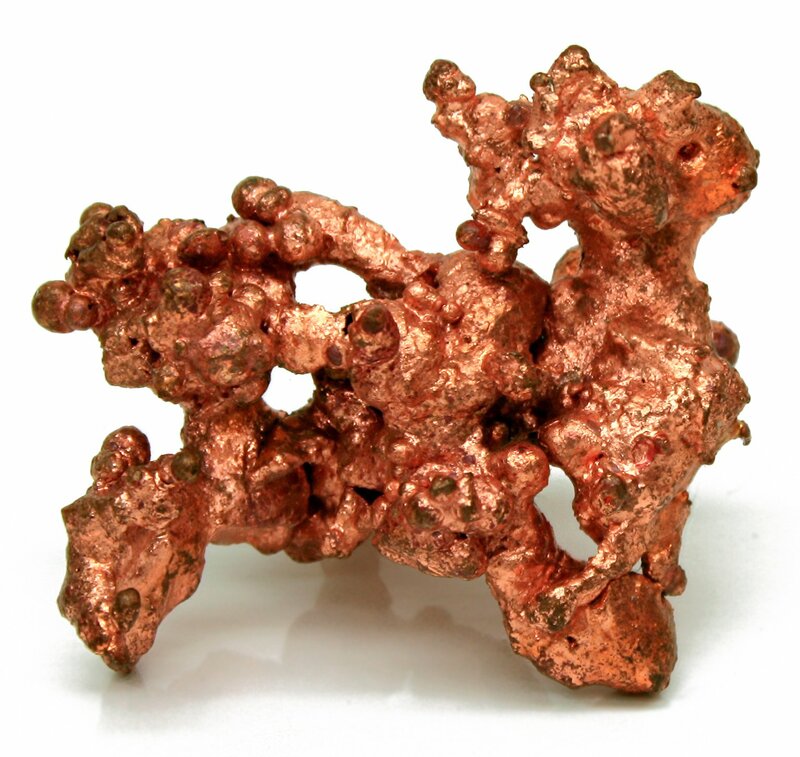 Copper is a reddish transition metal with atomic number 29 and element symbol Cu. The element symbol comes from the Latin name for the element, cuprum. These copper facts include chemical and physical data, general information, and trivia. Discovery: The first known use of copper dates back to 9000 BC in the Middle East. The only metals used by man earlier than copper were gold and meteoric iron. Name Origin: The name “copper” is a corrupted form of the Latin word “cuprum,” which is in turn a corrupted form of the name “aes cyprium.” Aes cyprium means “metal of Cyprus” and refers to Roman copper mining on the island of Cyprus. The modern name for the element first came into use around 1530. 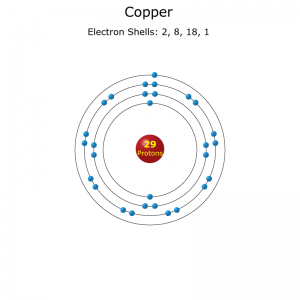 Isotopes: There are 29 isotopes of copper. Only copper-63 and copper-65 are stable, with copper-63 accounting for about 69% of the naturally occurring element. The other isotopes are radioactive. 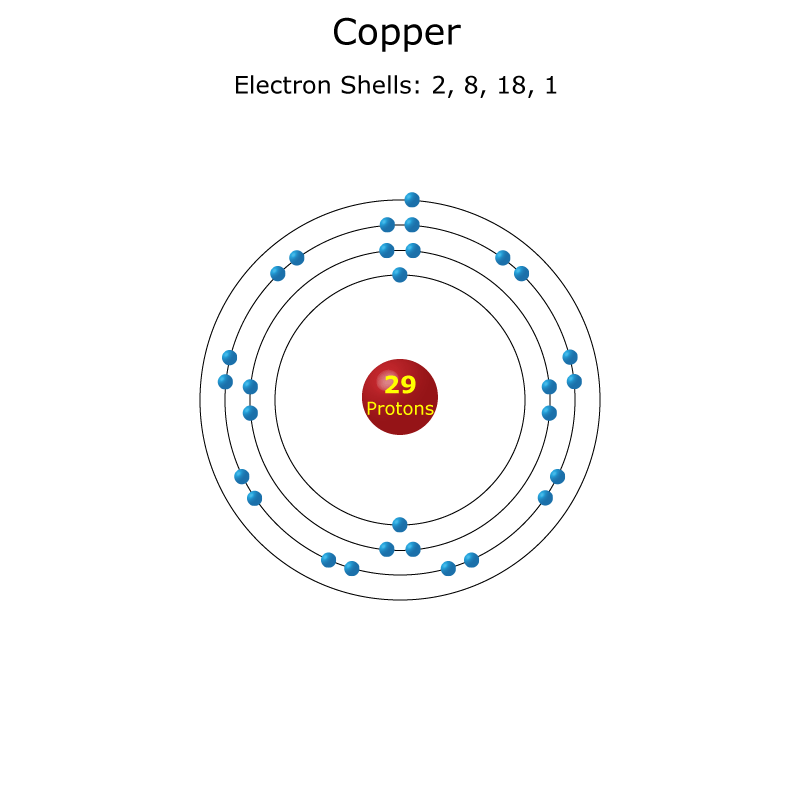 Electron shell configuration for copper. Oxidation States: The most common oxidation state is +2. Copper also has oxidation states of -2, +1, +3, and +4. Copper is one of only a few metals that exists in relatively pure form in nature or in a native state. This is how it came to be worked by ancient man. Otzi the Iceman, who lived approximately 3300 BCE, was found with an axe that had a head consisting of nearly pure copper. His hair contained high levels of arsenic, a toxic element used in copper smelting. The color of copper is unique among the elements. Most metals have are silver or gray in color. Gold and a few other metals are yellow. Only copper has a reddish-metallic luster. When copper is added to other metals, it can add a red color. This is how rose gold is made. Copper has many uses. The pure metal is used in wiring. Brass (copper and zinc) and bronze (copper and tin) are two important copper alloys. Copper is used for plumbing, coins, and cookware. When added to pool water, copper salts (not chlorine) can discolor hair so it has a green tinge. Copper is essential for human nutrition, particularly to form blood cells. The element occurs naturally in most water supplies and in foods, such as potatoes, beans, leafy greens, and grains. Excess copper cause jaundice and anemia and may turn urine blue. While copper is essential for humans and other vertebrates, most invertebrates have a low tolerance for its salts. Copper is also naturally antibacterial. This is why metal door knobs made of brass or bronze reduce disease transmission. Copper is also toxic to algae. Copper is easily recycled. About 80% of the copper mined to date remains in circulation. The metal is abundant in the Earth’s crust, found on average at a concentration of 50 parts per million. Copper ranks third, after iron and aluminum, in terms of metal used in the United States. While the most common oxidation state for copper is +2, the +1 state occurs in many compounds. One easy way to tell the ionization state of the element is via the flame test. Copper(II) turns a flame green, while copper(I) turns it blue. Like many transition metals near it on the periodic table, copper is ductile, malleable, an excellent conductor of heat and electricity, and corrosion resistant. It is relatively soft and does eventually oxidize to form green verdigris. Oxidation is the reason many brass and bronze statues turn green with age and while wearing inexpensive jewelry often causes a green skin discoloration. Most copper that is mined is extracted from copper sulfide ores. Large producers include Chile, the United States, Indonesia, and Peru. The price of copper is notoriously unstable. It’s 60 year low was $0.60/lb ($1.32/kg) in 1999 and $4.63/lb in 2011.